This annual summary aims to provide a sense of context for wildfire activity on the Western US-Affiliated Pacific Islands (USAPI) of Palau, Guam, the Northern Marianas, and Yap where fires are most frequent, due to annual dry seasons (Dec/Jan to May). However, fires can have severe impacts across all the USAPI during intense drought. Fire is a key threat to communities and native ecosystems on Pacific Islands. Fires also increase sediment run-o to nearshore coral reefs and protecting marine ecosystems is a key goal of re management for the entire Pacific region. Figure 1. Island land cover, with areas burned by fires in 2018 indicated in black. Land cover data from LANDFIRE. Table 1. Data for 2018 in bold, annual averages in lighter font. Fire information is limited in the USAPI. Defining 'average' re activity is difficult for some islands and continued record-keeping is critical. Guam has 27 years of re data, Yap and Palau both have 7 years, and Rota, Tinian, and Saipan each have 3 years. Guam had fewer fires but more area burned (>6,000acres) than usual. Palau had fewer fires and less area burned than average. Yap was unusually wet in 2018 and saw only 7 fires burning a small fraction of the annual average. Rota, Tinian and Saipan all had active fire years, however, longer term data is required to identify any trends. Larger islands have landscape mosaics composed of open savanna and closed canopy forest. The abundance and continuity of fine fuels in the savannas allows fires to ignite easily and carry across large distances. Fires in savanna vegetation expose forest edges to fire damage. In 2018, for example, 77-87% of the area burned on Guam, Saipan, and Palau occurred in savanna vegetation. Most of the remaining burned areas occurred in nonnative forest (primarily Leucaena leucocephala, Tangan tangan). 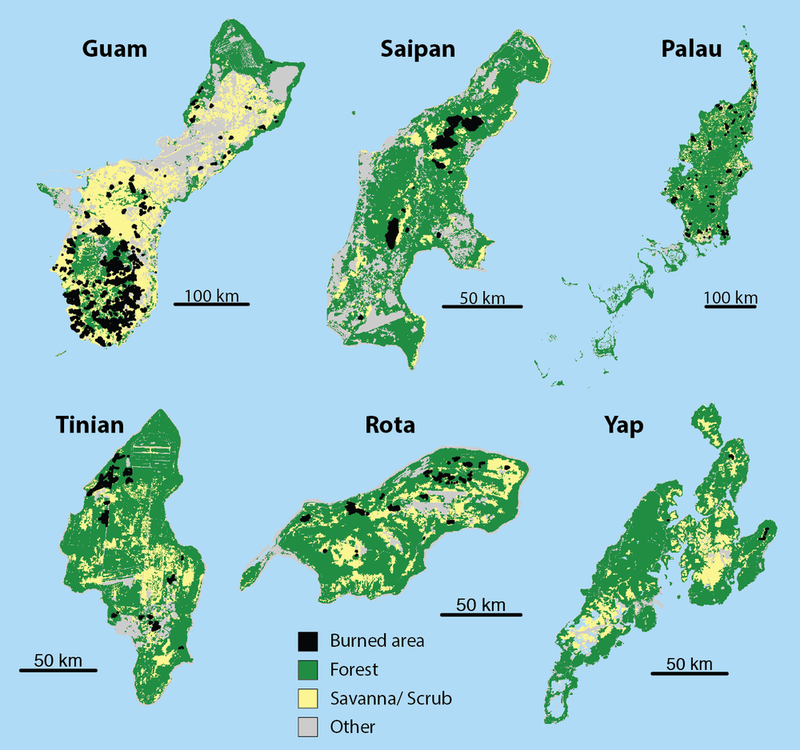 However, a significant proportion of mapped fires overlapped with native forest cover on Palau (69 acres of Upland Forest), Rota (42 acres of Limestone Forest), and Guam (290 acre of Ravine Forest). Ground-based assessments are required to determine how these forests were impacted, however, native forest on Pacific Islands tends to be highly sensitive to fire and slow to recover. 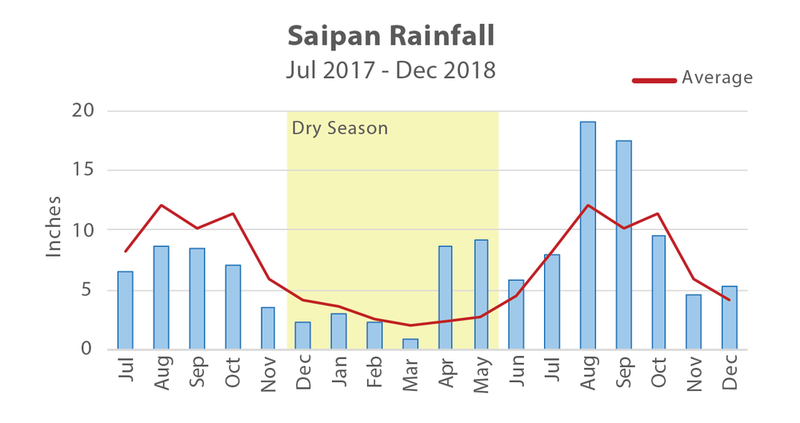 Monthly rainfall on Saipan and Tinian were well below average from mid-2017 into the dry season of 2018, contributing to numerous grass fires (Fig. 2). Yap had an unusually wet year, especially at the start of 2018’s dry season (Jan-Mar) contributing to very low levels of fire activity (Fig. 3). For Guam, 2017 and 2018 were wetter than average, leading to increased fuel loads as noted by fire responders with Guam Forestry. Typhoon Mangkhut passed over Guam in September, and Super Typhoon Yutu landed on Tinian and Saipan in October. Both storms caused severe damage and brought heavy precipitation. Although the rain may lower fire risk in the short term, increased grass growth and tree falls will increase fuel loads for the upcoming fire season. Figure 2. Saipan’s rainfall was below average going into the dry season. Figure 3. Yap experienced above-average rainfall from July 2017 to March 2018, contributing to low re activity. Fire increases erosion and sediment run-off to nearshore coral reefs, and protecting marine ecosystems is a key goal of fire management for the region. For example, managers on Saipan notice that landslides tend to occur in some areas affected by grass fires, and erosion from the fire-prone Talakhya area on Rota threatens the island’s southern marine ecosystems. On Tinian wildfires threaten farms and homes, and also pose the danger of activating unexploded ordnance. In addition, managers on Guam and Saipan note that fires threaten native and endangered species and open areas up to nuisance plant invasions, especially swordgrass (Miscanthus oridulus), which increases future fire risk. A range of activities in 2018 sought to address fire risk. Fuel load reduction projects on Guam included removal of ladder fuels and widow makers, as well as installation of greenbelts and firebreaks. The Northern Mariana Islands also all had programs for public education and outreach, including school presentation programs. On Saipan, outreach included billboards, radio talk shows, and TV commercials. Rota continued maintenance of fire lanes and hydrants, and for the past two years has limited access to the most fire-prone area, resulting in a decrease of both ignitions and area burned. In March, the Department of Fire and Emergency Medical Services partnered with Tinian’s Department of Public Works to create fire breaks around residences vulnerable to wildfire. Thanks to Christine Camacho-Fejeran, Susan Cordell, Julian Dendy, JB Friday, and CNMI Department of Fire and Emergency Medical Services. Data: Guam Forestry & Soil Resources Division, Guam Fire Department, National Park Service, and US Forest Service. Analysis: Clay Trauernicht, University of Hawaii at Manoa Wildfire Extension. Layout & Design: Melissa Kunz, Hawaii Wildfie Management Organization.